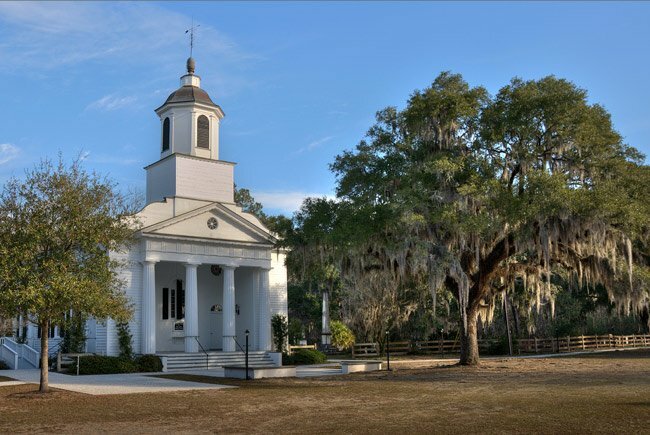 Established circa 1685, the Presbyterian Church on Edisto Island is one of the oldest Presbyterian churches in the country. Edisto Island was acquired by Lord Ashley Cooper, one of the Lord’s Proprietors, in 1674. By the 1680s Colonial Governor Joseph Morton had settled here. A letter dated 1689 references “Presbyterians meeting on Edisto,” leaving historians to estimate that the congregation organized about five years prior. The main church building in use today was constructed in 1831, and except for some minor changes to the portico and ceiling, has changed very little in nearly 200 years. It was restored in 1836 and underwent more renovations in 1995, though the character of the building has not changed since its original construction. 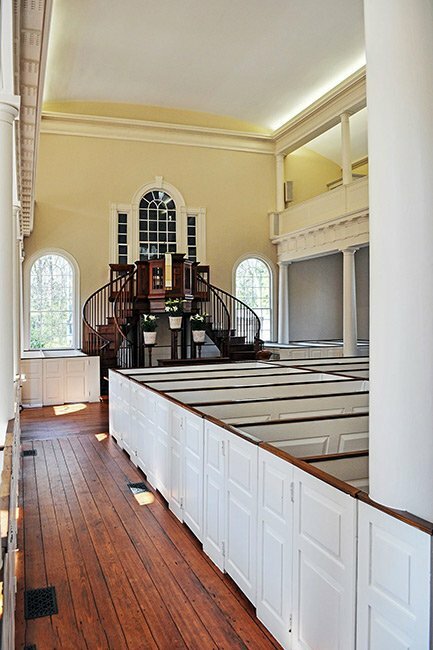 The manse, which also has been restored, has accommodated pastors continuously since the eighteenth century. Union troops occupied the island in 1861 during the Civil War, and whites were forced to evacuate. However, their slaves remained on the island, and having once worshiped here in the slave gallery – today a balcony – they elected their own session, named a pastor, and used the church as their own until 1867. That year Dr. William States Lee, who had been pastor prior to the war, received a writ from the federal government to have the church returned to white members. 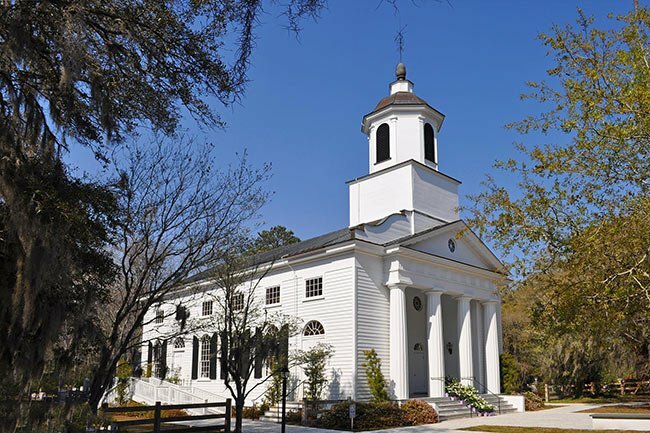 The black members then founded nearby Edisto Island Presbyterian Church. 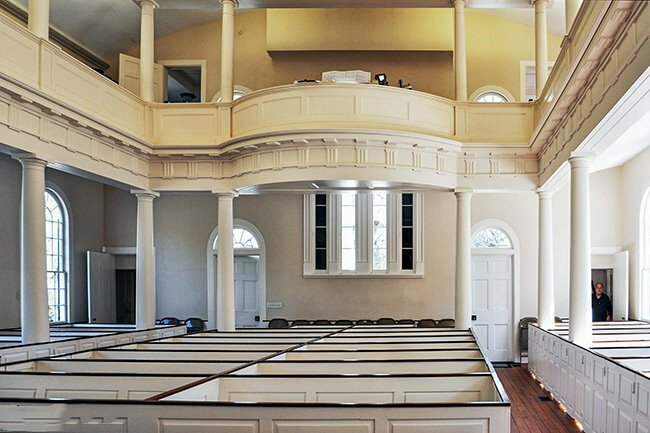 Today both churches are members of the Charleston-Atlantic Presbytery. The church grounds contain a Prayer Chapel, pictured above, which is open to people throughout the week for prayer and meditation. Prayer requests left in the Prayer Chapel are acknowledged during each Sunday’s People’s Prayer segment of worship. The churchyard contains the graves of islanders dating back to 1787, while the nearby manse dates to around 1790. Many island natives and genealogists conduct research based on the tombs in this graveyard. 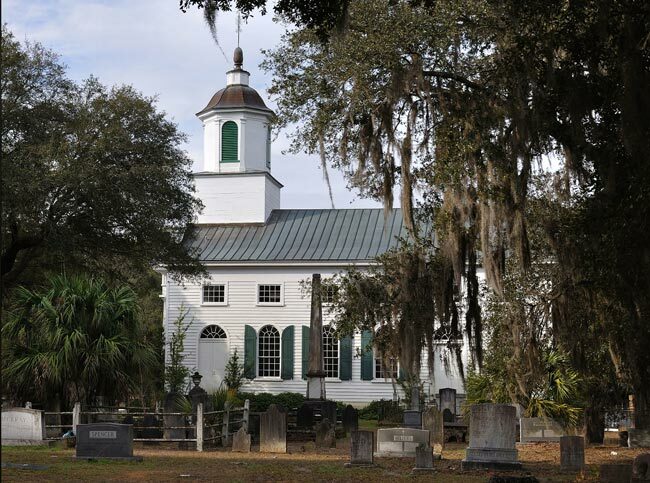 Edisto Island Presbyterian Church, a two-story, rectangular structure, was built 1831 by a Mr. Pillans. In 1836, E.M. Curtis, an architect of Charleston, replaced the portico and added a coved ceiling over the interior. Except for these alterations, the building remains original. Massive Greek Doric columns of the portico support a triangular pediment which has a central circular window. The frieze at the pediment’s base features alternating metopes and triglyphs. The church also features large Palladian entrances with semi-circular fanlights. 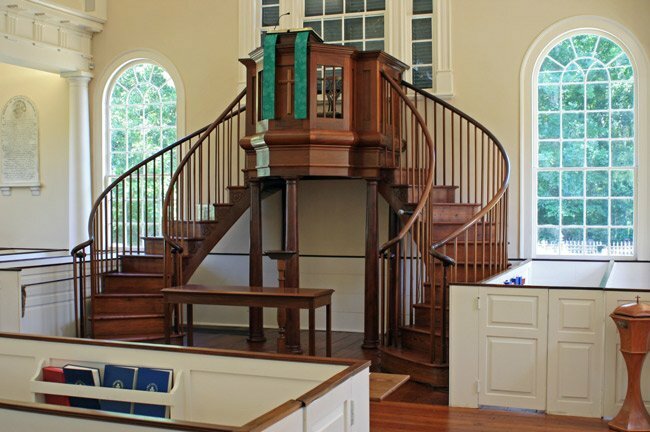 A cupola is used in place of a steeple on the low gabled roofline. The side walls each have two entrances identical to the front. Between there are three 12 over 12 windows with fanlights and arched shutters. Six small one-sash windows on the second floor level are placed directly above the six openings on the first floor. 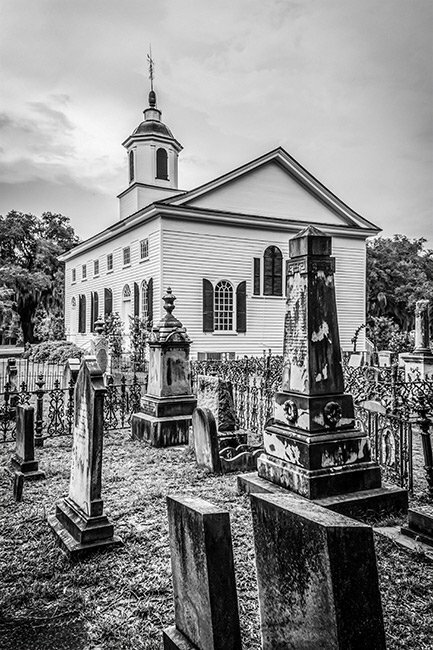 This church serves one of the oldest Presbyterian congregations in South Carolina, having been formed about 1685. 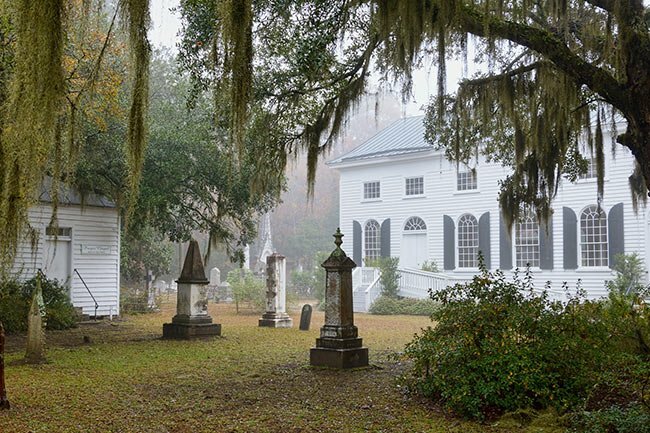 Contributor Rusty Williams writes, “Containing names such as Mikell, Whaley, McConkey, Pope, Bailey, Baynard and Murray, the graveyard is a testimonial to the early families of Edisto Island who are so important to the island’s heritage. Five former pastors are at rest here including the Reverend William States Lee, the longest serving pastor in the history of the church.” Williams also notes that the tombstones and mausoleums are true works of art. I am Robert Royall, I left a note in the prayer room today. I am just thankful for that little room. My failure was that I forgot to mention all of the good works of all the Charleston churches. Hi, Nancy. We have included the church’s website on the page above the map. I suggest calling someone from the church to help with your inquiry. Best of luck! My son in law’s great aunt, Mary May, lived on Edisto Island in the 1970s and 1980s. She had been a missionary to Africa. I recently received a copy of a “Brief History” 1685 to 1985 of the church. The drawing on the front on the pamphlet is of the church by Mary May. Would you know if the church has this drawing by her? I live in Charleston and plan to visit to see if we can find any info about her. Could you let me know if anyone at the church would be available to talk with us? Loved the church, can not wait to go again and take more pictures. Is there a list of graves at this site?